My birthday is in two days. 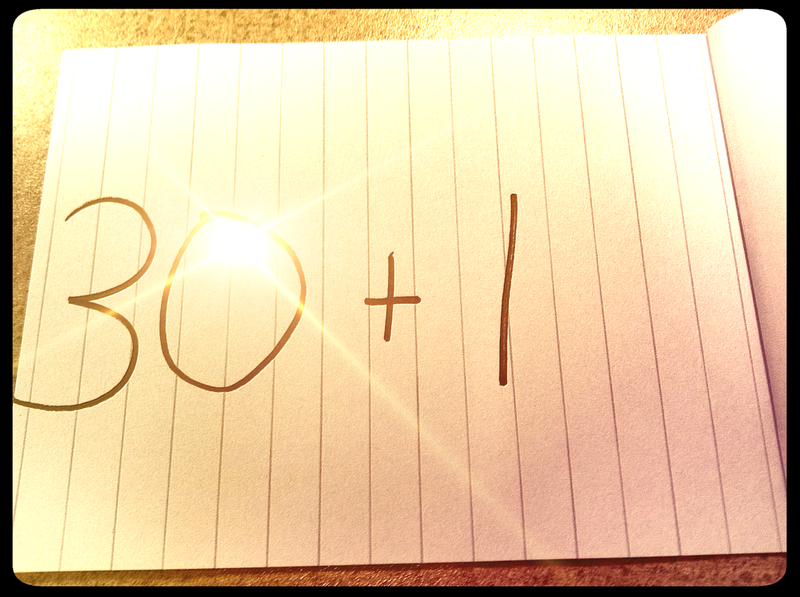 As a result I have been doing a lot of reflecting on "30." I'm finding that approaching 31 is a lot harder than turning 30 was. I always envisioned 30 as an exciting age, an adult age. I had my own ideas about what it would mean for me and always looked forward to it as a time when I would know more about myself and have a few more things figured out. Well I definitely know a lot more about myself but as for having a few more things figured out, I'm not so sure. As I enter 31 I have just as many if not more questions than I have ever had, mind you this has a lot less to do with age and a lot more to do with transitioning times in my life. I wonder if I am making the "right" decisions for myself and if one of them is going to lead me down a path I don't really want to go. But then I remember that I believe that there are no wrong decisions and every lesson I learn I am supposed to in order to progress. Progress is another one of the unending questions, am I making progress? Am I still learning? Am I working towards something? Am I contributing? The questions I ask have questions to ask. A question is a question wrapped inside a question. I worry that this is not normal but then I've never been normal a day in my life. But seriously, I do wonder, is it normal for a single girl about to turn 31 to feel a bit lost, a bit hopeful, a bit like she is at the precipice of life and full of possibility and then lost again? So many people around me seem to be settled into their lives and well, happy, while I am constantly pondering and wandering. Following my own way has its advantages but also the often debilitating "am I doing this right?" issue. While I know I am doing what I need to for myself and my journey the social conditioning has a creeping power that I have yet to fully defeat. I keep thinking this will be the last trip, then I'll come home and "settle down" find a career that I enjoy and maybe find someone to share it with. That all seems great, but then I remember, there is no last trip for me. It is ongoing and always will be, this is part of me. That doesn't mean I don't hope some parts of my life will simmer down, I do, but maybe just not right now, and that's ok.
Well this post spiraled out of control. What I really intended to write was a year recap in fun things, so here goes. I visited two more countries, I finished a two year training program for shamanic studies, I made an effort to be more present in my friendships and less counselor/fixer. I revamped the design of this blog and put a bit more effort into populating things here. I committed to being more open and honest more often, especially about my feelings. I visited a couple new states. I experienced extreme weather heat and extreme weather freezing. I made an effort to seek out the people I love and visit and spend time with them. I attended some interesting workshops, tried glass blowing, pottery, took up painting again and renewed my love for photography. I made a baby afghan and some scarves, then started crocheting for fun. I got to welcome twin baby second cousins and found myself saying "there really are two of them!" I took some nice hikes and did an interesting cleanse. I'm sure there are other things but this is what springs to mind right now. I'm looking forward to my new year of life and feeling blessed for all of the ones I've had so far. I can't wait to see what's in store! Here's to another year of travel, family, friends, love, writing and the never ending adventure of learning about myself and this life.